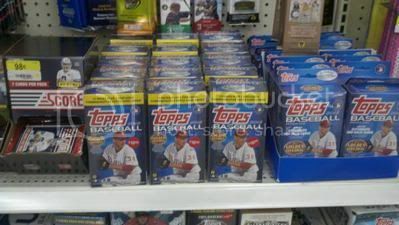 I spent the weekend constantly checking Twitter and eBay to see if 2012 Topps hit retail stores a little early. There wasn't much on Saturday or Sunday but today it became obvious that many Walmart's already had the cards in stock. After work, I set out to buy some cards. There are a few Walmarts between my job and my house. The first one I went to had nothing but the second one was fully stocked. Here's some of what I got in the first blaster. I really like the Gold Futures and 1987 minis. 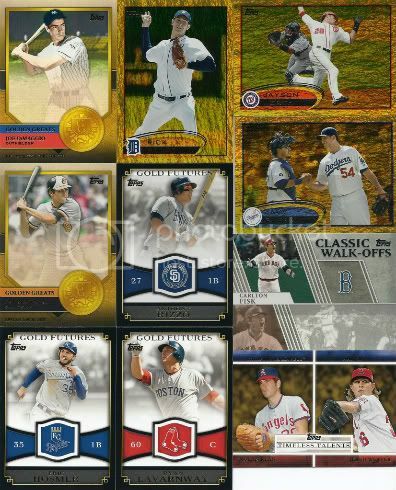 The sparkly, gold parallels aren't bad either. Our new friend, Robert, sent us a few D-Backs cards. You may know Robert from such blogs as Serial Number Insanity or $30 a Week Habit. We sent Robert a few serial numbered cards for his insanity project. In return he sent us these super cool D-Backs cards. 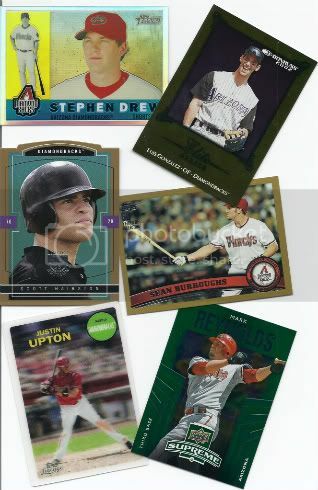 My favorite is the Stephen Drew refractor. Thanks, Robert! 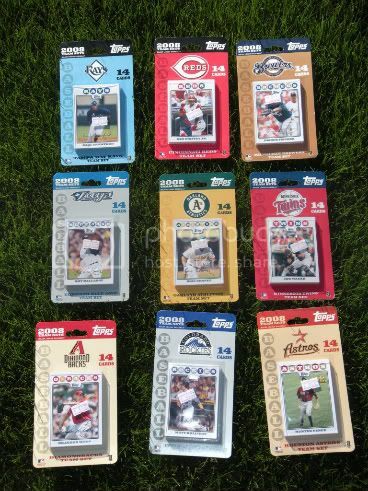 I found a seller on eBay who had a bunch of 2008 Topps Team Sets listed for just under $3 each. A few of them I already had but I scored 9 new ones. I opened these up yesterday. There's already a few cards I know I should be able to get signed during Spring Training. 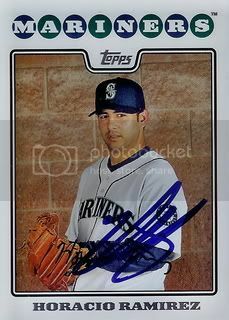 Horacio Ramirez put together a few nice seasons for the Atlanta Braves and the Mariners looked to him to be a big part of their rotation in 2007. That didn't happen. He won 8 games and had an era over 7. Since then Horacio bounced around to a few different teams. Most recently he spent some time in Los Angeles with the Angels. We recently picked up this signed 08 Topps card for our set. It features a nice Spring Training pic of Horacio over at the Peoria Sports Complex. 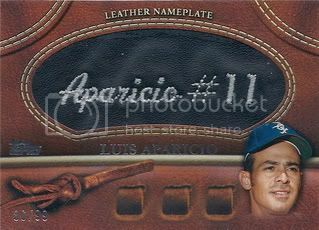 By now I'm sure you've seen the Leather Nameplates that Topps inserted into it's 2011 set. They put out two versions featuring Luis Aparicio. One has features him on the White Sox and the other on the Orioles. We got them both. 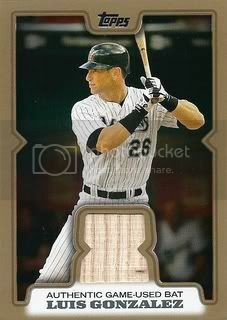 Oh and the White Sox one is the rarer black version and is numbered 86/99. Two nice pickups for our Lil Luis collection. 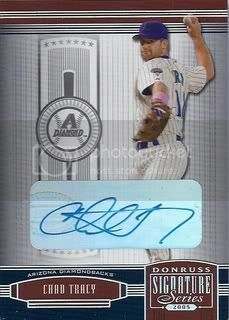 We haven't had too many of these this month but it's time for another signed 08 Topps card. 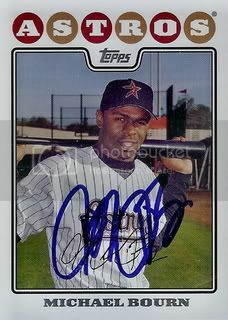 2005 National League All-Star, Felipe Lopez signed a card for our set. 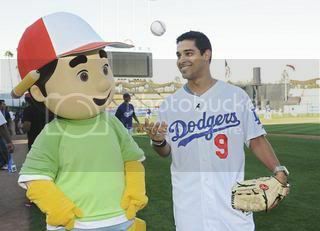 In his ten year career, Felipe has played for nine different teams including the Diamondbacks. Around the end of his time here in Arizona, I remember hearing a lot about his bad attitude in the clubhouse and lack of hustle on the field. I'll be curious to see where he lands in 2012. 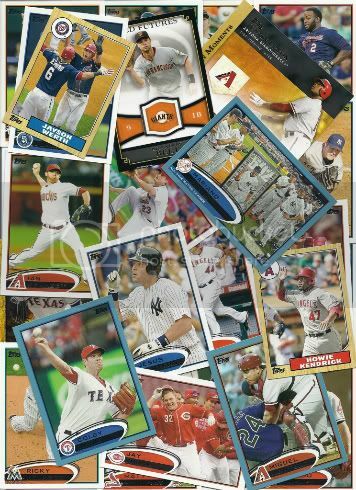 While reading various blogs the past few days, I've seen a bunch of breaks on the 2011 Topps Value Boxes. You guys motivated me to go out and get one for myself. I mean it's hard to turn down a sale on baseball cards, right? If you haven't heard, Wal-Mart is closing these out. 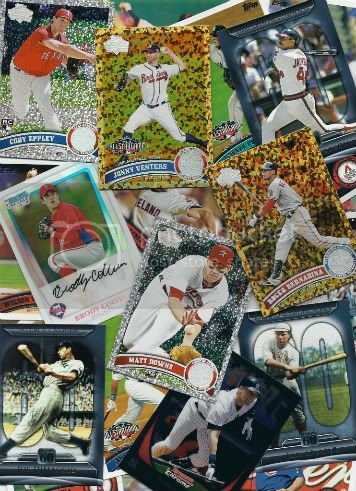 For just over ten bucks you get five packs of 2011 Topps Update, one pack of 2011 Bowman Chrome, an exclusive Bryce Harper rookie card, and a Diamond Giveaway code. 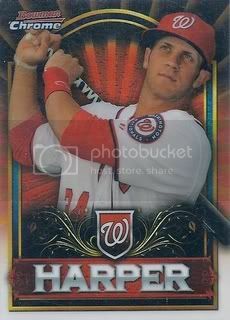 This is our first Bryce Harper card. Too bad it's probably his least desirable one to date. Nothing too exciting in the packs either. We did get a refractor out of of the Bowman Chrome. It's of Phillies prospect, Brody Colvin. This dude's on the top 100 prospect list so we might have something hear in a few years. Everything except the Harper, Colvin, Eppley, and Venters are available if you need them. The eBay app on my phone is great. I've been trying to clear out some non-baseball card collectibles and it's helped me keep up-to-date with what's going on every second of everyday. It also has given me the ability to search for cards 24x7 too. Anytime I have some downtime, it seems like I'll pull out my phone and do a quick search. I've won cards while waiting at the car wash, the Taco Bell drive thru, red lights (while my wife's driving), etc. When I'm searching, I'll occasionally throw in a low bid on things I don't think I'll win. 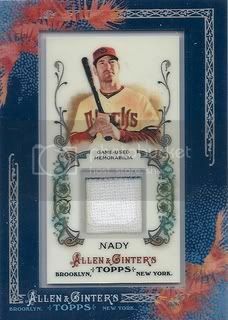 This Xavier Nady jersey card is one of those items. I put in a bid of $2.05 and I didn't think I'd win. A few days later and this card was mine. A nice pickup for our D-Backs collection. Not bad for just over two bucks and free shipping. We've been busy grabbing a few more Daniel Hudson autographs recently. In fact, we've got three new ones to post. 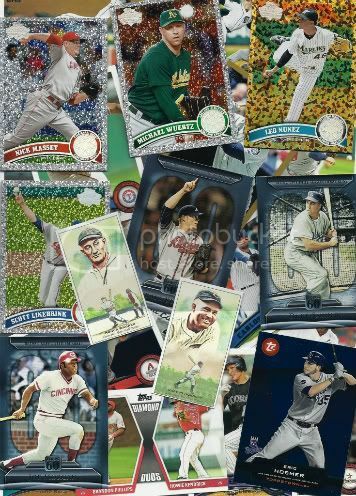 All are from the 2011 Topps Marquee set. While they look similar, they all have different jersey color combinations. They're all great and each numbered to 400. My favorite is the grey/grey. Jeff over at My Sports Obsession sent us an awesome package full of Diamondbacks! He sent a stack of about 100 random D-Backs, two autographs, and a jersey card. The random D-Backs included everything from legends like Curt Schilling and Randy Johnson and current favorites like Miguel Montero and Ian Kennedy. My favorite part were the two autographs ( one of Chad Tracy from 2005 Donruss Signature Series and one of Tony Pena from 2005 UD SPX ) and the jersey card ( 2005 Topps Finest Mark Grace ). The Grace jersey card is super shiny and super cool. If you haven't been to Jeff's blog, check it out. 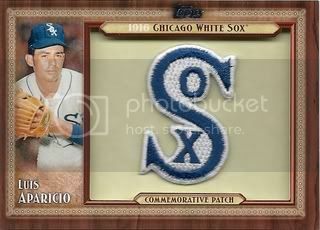 He has a nice collection of Chicago White Sox and is working on a few vintage sets. Thanks for all of the great cards, Jeff! 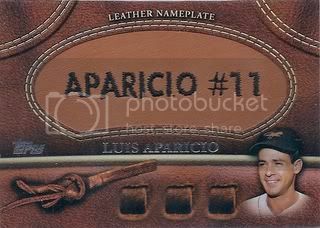 2011 brought us quite a few nice Luis Aparicio cards. The last one came from the Tier One set. Kind of a drab and boring card overall but it is numbered. I think it would have looked better if Topps let the photo run all the way to the edges with no white halo border. But I guess if they did that they wouldn't have been able to do all of the parallels. 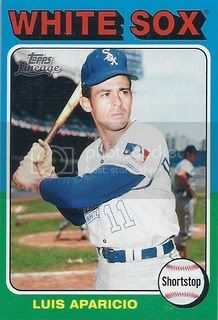 We finally grabbed the 2011 Topps Lineage Luis Aparicio 1975 mini card. When Lineage first came out there were several of these on eBay but all went for more than we wanted to pay. Our patience paid off and we found one for a good price. It's nice to be able to cross this one off our want list. Picked up a signed 08 Topps card of 2010 All-Star and current Atlanta Braves outfielder, Michael Bourn for our set. This one came to us from a friend on SportsGraphing.com. I don't think my wife ever missed an episode of All My Children since I met her. Well at least until ABC cancelled it back in October. That's six years and probably over 1500 episodes. It's rare that I find a trading card that my wife would enjoy. Thanks to the new Topps American Pie set, I found two! I picked her up the Susan Lucci relic and autograph. She was happy. Well... she at least pretended to be happy for a few minutes and then put them away in a drawer in our kitchen probably never to be touched again. I think I was more excited than she was. I mean I must have watched at least a third of those episodes with her so I know all about Erica Kane and Pine Valley. 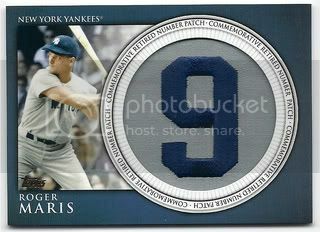 Another 08 Topps card for Free Shipping Friday! We picked up this Garrett Atkins jersey card for $1.25 with free shipping. Now I know there's not a whole lot of demand out there for Atkins cards but I love the price and the nice purple swatch. 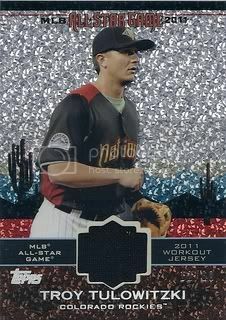 Totally scored a diamond anniversary parallel Troy Tulowitzki jersey card to go with our collection of 2011 Topps Update All-Star jersey cards. Got this one for less than five bucks. It's numbered 12/60 on the lower right corner. 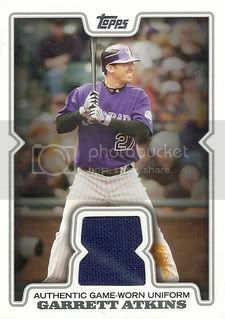 You may remember our post last October where we had picked up 28 different All-Star jersey cards from the 2011 Topps Update set. Well I picked up three more recently including the Justin Upton that I had been wanting from the start. I sent a few Colorado Rockies cards to Johnny over at Cards from the Quarry. 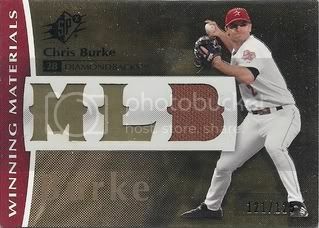 In return he sent me a rad Chris Burke jersey card and a bunch of Diamondbacks. Good stuff. I didn't have any of these. 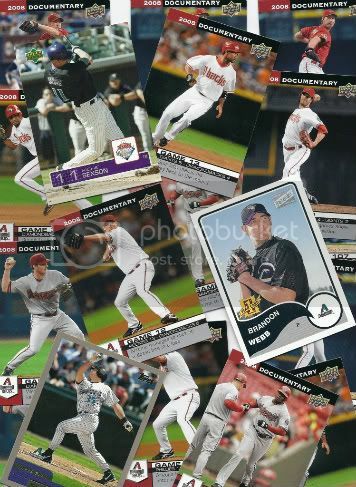 Also, I've created a "Diamondbacks Collection" label so you can quickly view all of our favorite D-Backs cards. I guess now I'm officially a D-Backs collector. So keep us in mind if you've got any extras you don't want from our favorite team, we'll be glad to give them a good home. 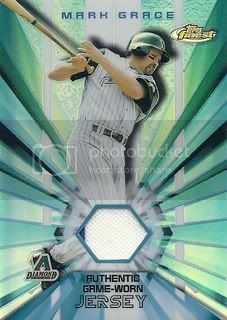 Today's kicks off the newest feature here at My 2008 Topps Set Blog. It's Free Shipping Friday! What does that mean? I'm a sucker for eBay auctions with free shipping. On Fridays I'll be posting cards I bought for cheap that had free shipping. In a lot of cases the seller lost money to send us these. Man, I love it when that happens. 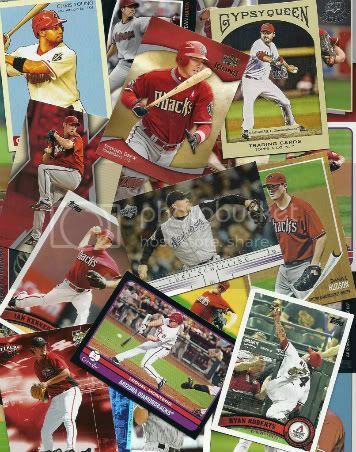 Expect to see some cards for our growing D-Backs collection on Free Shipping Fridays as well as various 2008 Topps stuff and random autographs and relic cards that were just so cheap, I couldn't pass them up. First up is a card that I threw in a really low bid for and ended up winning. 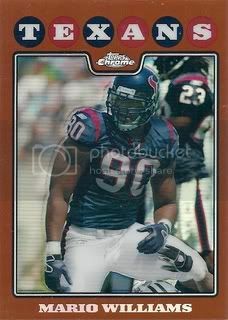 We got this Mario Williams Gold Refractor for 11 cents. It's numbered 304/425 on the back. I haven't done much with the 2008 Topps football set but I was glad to grab this one for our collection. 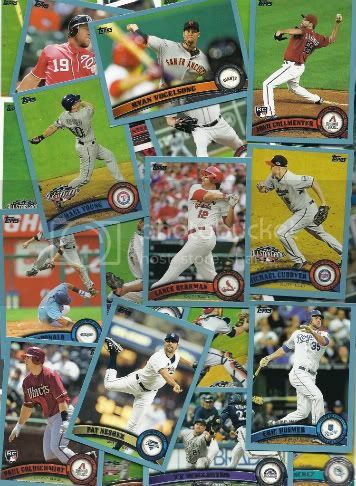 I've spent a decent amount of time searching eBay for good deals on 2008 Topps cards the past three years so I've seen pretty much everything that's out there. 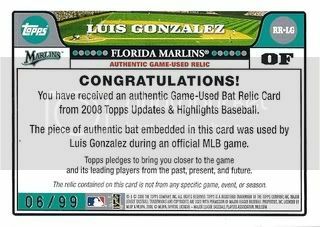 This is the only gold parallel relic card I've seen. Lucky for me, it's of one of my favorite former Diamondbacks, Luis Gonzalez. This one looks even better in person and is numbered to 99 on the back. 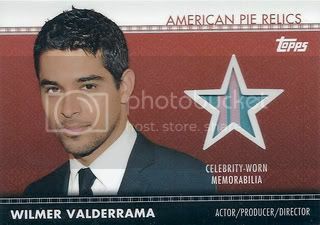 I jumped on the 2011 Topps American Pie bandwagon and picked up this relic card of Wilmer Valderrama. It's got a nice colorful swatch from a mystery article of clothing worn by Handy Manny himself. I don't hate this set. It has a decent checklist and the design for the relics & autos look pretty nice. 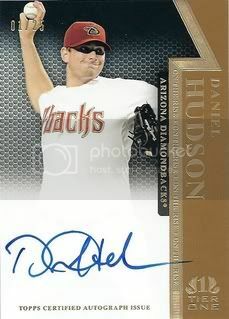 Last November we posted Daniel Hudson's regular certified autograph from the 2011 Topps Tier One set. If you thought that card was nice, I've got good news. We scored the gold version too! It's a little hard to see but this one's numbered 1/25. This manufactured patch card came to us from Daniel over at It's Like Having My Own Card Shop. He pulled it out of a blaster and thought we would like it. He was right! This card's pretty awesome. I really like the vintage Sox logo. My wife got me a blaster from 2011 Topps Update for Christmas. She got it at Wal-Mart so it came with two packs of blue parallel cards. Nothing too exciting. 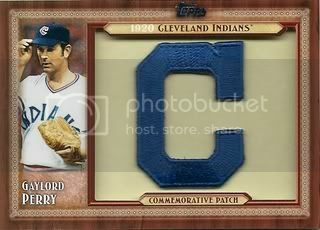 I did get a few D-Backs and a Pat Neshek in the blues and a nice Gaylord Perry throwback manufactured patch card. Everything else is available if you need it. Keep My Blog Alive - Pretty simple, right? We need to keep blogging. We came just shy of 300 posts in 2010 & 2011, I'd like to exceed that number in 2012. I have plenty of ideas and plenty of cards so this should be easy as long as I can find the time. 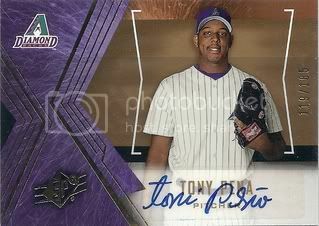 Wondering what to expect from My 2008 Topps Set Blog in 2012? 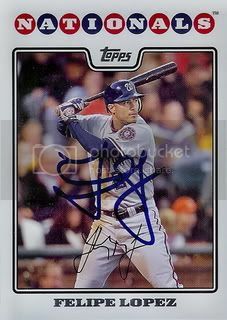 We'll be getting as many 2008 Topps cards signed that we can. Base, Chrome, parallels, Opening Day, if it's 08 Topps then we want to get it signed for our collection. 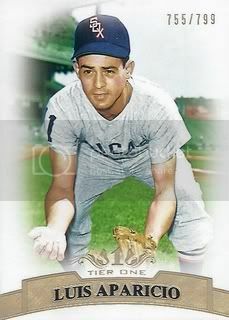 Expect a lot more posts for our Luis Aparicio collection too and maybe a Daniel Hudson certified autograph or two. This Friday we'll be launching a new feature called "Free Shipping Friday!" Should be fun. Thanks to everyone who reads our blog. 2012's going to be a good year.